Designed by Helen Blakey Flowers, Toronto ON. Send our traditional flower centerpiece with a fashion forward colour scheme. 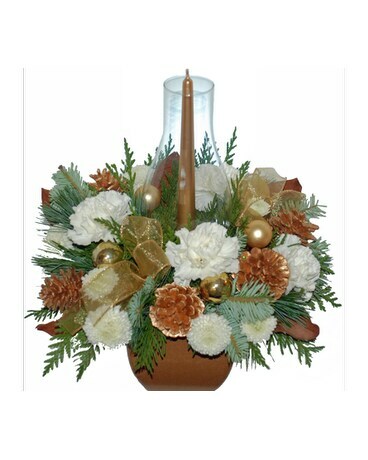 Nice and neutral it will compliment any holiday decor. Fragrant evergreen boughs are paired with velvety brown magnolia leaves for the base of this design. A gold taper candle in a glass hurricane is surrounded by crisp white carnations and mums, trimmed with gold pine cones, sheer ribbons and glass balls. A long lasting, fragrant holiday gift. Approx size; 28 cm W X 35 cm H.
Available in the Toronto (all M postal codes) area and surronding GTA. Substitution of similar product will be neccessary for delivery outside of our local Toronto flower shop delivery zone.